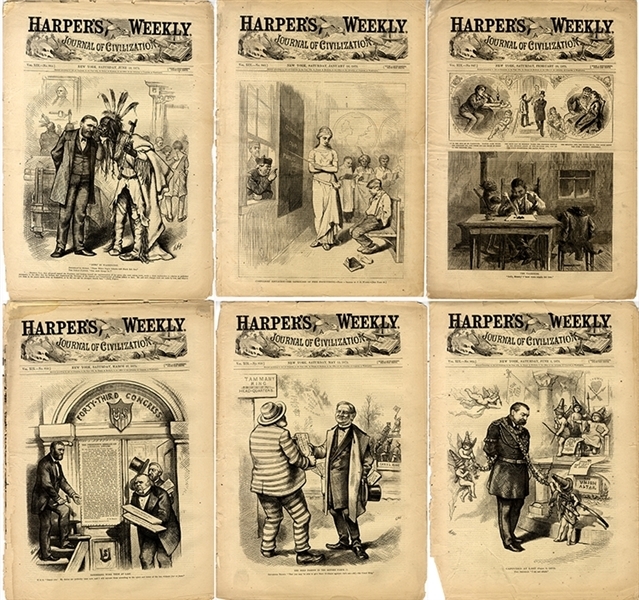 Group of 14 issues of Harper’s Weekly from 1875. Some issues have inside pages still untrimmed. Some pages separated at spine. Somewhat brittle. The saving grace in this lot is the prolific satire cartoonist THOMAS NAST. He has work in almost every issue, many front, smaller cartoons inside. Cartoon mostly relate to TAMMANY, the Catholic Church and an array of other political topics. Highlights include: 1/16: Front, “Compulsory Education” (church/state). Inside, another political statement from NAST with Caesar theme. ; 1/23: Front, Spain’s Ex-Queen Isabella and son Alfonso. Inside NAST on church politics. ; 2/6: Front in a Mormon Settlement. Inside, Great NAST centerspread political satire on animals running loose from the zoo. ; 2/20: Front, Collage for Valentines Day. Pair of small NAST political cartoons. ; 3/27: Front, Nast depicts PRESIDENT GRANT’S message on the Louisiana affairs. INside, 5/15: Front, NAST depicts Gov. Tilden giving pardon to prisoner BOSS TWEED. Inside art collage “In the Indian Territory”; NAST on “Another Feather in Yankee Doodle’s Hat” (Uncle Sam and the anniversary of the Minute Men). ; 5/8: Front, “The Late John Harper.” Inside, Walrus Hunt, Fishing Expedition; Duelling Swans; NAST on “The American River Ganges” and “No Church Need Apply” (Catholicism); 5/22: Front: “THe Menace of the Vatican” (Pope with his war dogs). Inside. ; 5/29: Front: Wreck of the “Shiller”. Inside, Blacks “Going to Market in Savannah”; Suburbs of San Francisco. Vertical centerspread of Free and Accepted Masons of England; Sketches in China Town, San Francisco. ; 6/5: Front: Phil Sheridan “captured” (by Thomas Nast); Inside Nast: Tub has no bottom (public corruption). ; 6/19: Front, NAST shows Pres. Grant and feathered Indian in conference. Inside, NAST portrays himself prepping a political cartoon. ; 7/10: Front: Walk in the woods illustration. Inside, International Rifle Match; Washington at Cambridge; Building “Old Ironsides”; NAST art, “Homo-phobia”; 10/10: Front: Art Furniture at Centennial. More on Centennial inside. Inside has NAST art on KKK. ; 12/4: Front, “Thanksgiving Finance” by Nast. Inside Nast on Tammany with “Two-Ring Tailors.” ; 12/25: Front depicts Blacks “Selling Christmas Greens” in Richmond. Inside Nast shows James Gordon Bennett the newspaper publisher “In His Property Room.” Large two-page vertical Nast, “Good-Bye” (Shame for the escape of Boss Tweed).